Men's basketball soared to playoffs, while the women's program struggled throughout the season. The Cal State LA men’s basketball team had their fair share of highs and lows during 2018-19 season. 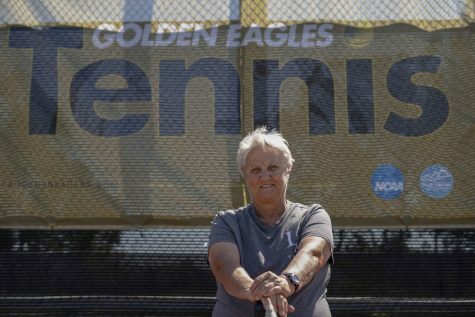 The Golden Eagles were picked to finish sixth in the California Collegiate Athletic Association (CCAA) in a preseason poll by the 13 conference head coaches. This was Jim Saia’s third season as the Cal State LA head coach and his team finished the season with a 18-12 record overall and fifth in the CCAA with a record of 13-9. Overall, the Golden Eagles’ home record was 7-6, at the University Gym, but on the road was where they shined brightest. Their overall road record was 10-4, which was tied for the best amongst the 13 CCAA teams. 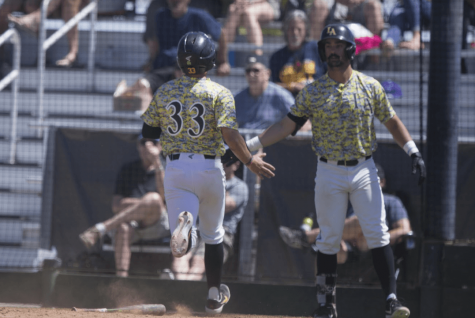 As conference play began, the Golden Eagles started off 5-2, but struggled midway through the season as they posted a 3-6 record in their next nine games. 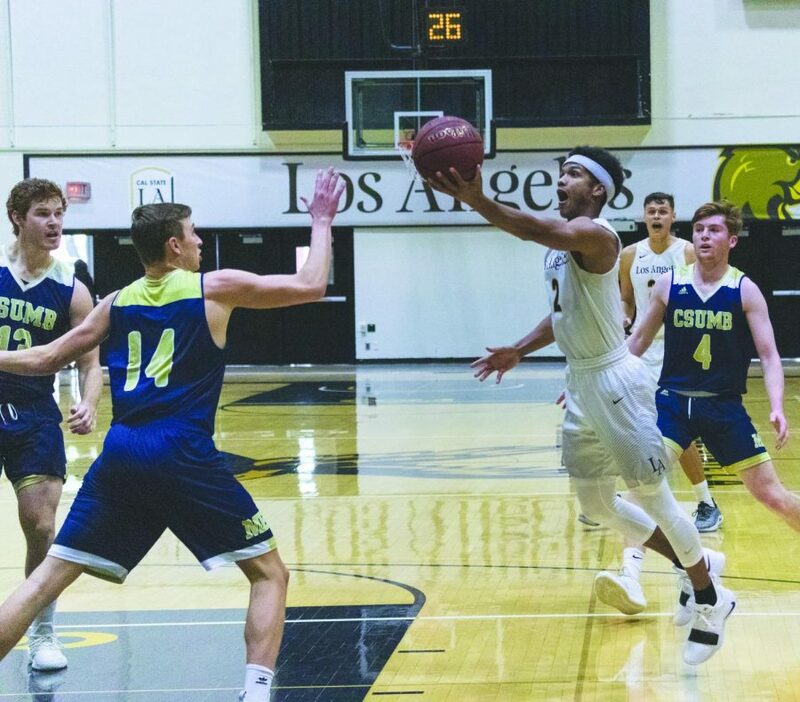 This did not discouraged Cal State LA, as they came in hot down the stretch and won five of their last six games, including a four-game winning streak to cap off their regular season. 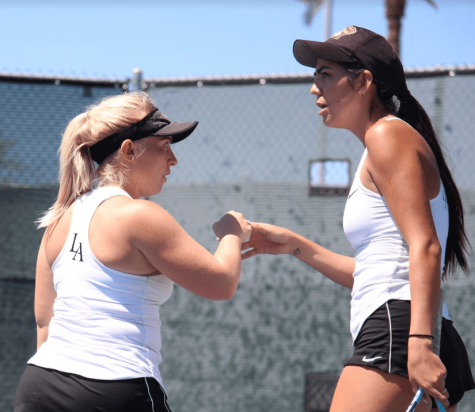 In the opening round of the CCAA Tournament, the fifth seed Golden Eagles were set to battle the fourth seed San Francisco State Gators. History was not on the Golden Eagles’ side as they lost seven of their previous matchups against the Gators. Both teams squared off in the tournament on three separate occasions, but the Gators were victorious in each of the matchups. The last time the Golden Eagles won at San Francisco State was back on Feb. 24, 2012. Despite their previous track record against the Gators, the Golden Eagles endured two blackouts and overcame the odds to defeat them in overtime, 81-76. In CCAA semifinals on March 8, Cal State LA faced off against Cal Poly Pomona Broncos and it was a game to remember. Both teams battled it out in a classic four-overtime marathon, but in the end, the Broncos outlasted the Golden Eagles, 102-99 and eliminated them from the tournament. 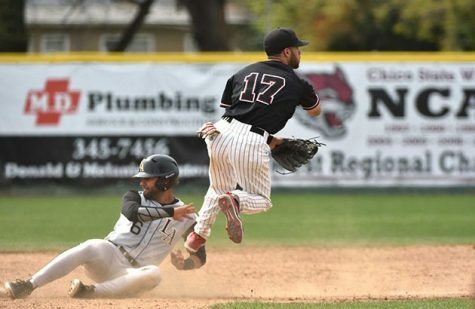 This was the final game of the season for Cal State LA, as they failed to qualify for the National Collegiate Athletic Association (NCAA) Division II Tournament. The Golden Eagles were involved in many close games this season, with 11 being decided by three points or less. Unfortunately, Cal State LA was on the losing end of those games seven times. As a team, the “Black and Gold” shot 39.6 percent from the field, the lowest in the CCAA. However, Cal State LA finished fifth in the CCAA in total points scored (1,614) and points per game (73.4). They made the second most three-pointers in the conference (231) and had the second most steals in the CCAA (212). Some of the top performers for the Golden Eagles included their guard Fard Muhammad, who scored the most points this season with 354 points and averaged the most points per game, with 11.8. Muhammad also led the team in assists with 62 and 3-pointers made with 65. Forward Ja’Sean Lewis led his team in rebounds with 221, and the most steals with 51. He also had the most blocks in the conference with 50 (he had 68 blocks overall). No basketball program would be completed without thanking the seniors for their contributions to the team. This year’s seniors include team manager Mohammad Isse, guards Kenneth Cyprian, Devin Means, Grant Arthur and Miles Ford, and forwards Brandon Hitchman and Jihad Woods. Lewis would be named to the All-CCAA Second Team. His teammates, Means and Muhammad both received honorable mention by the votes from the 13 CCAA coaches. Guard Shacquille Dawkins was named to the CCAA All-Tournament Team for his outstanding performance in the tournament. Despite not coming up with a championship, the Golden Eagles’ performance this season shows how much heart and determination they have. They played some of their best basketball down the stretch and took opponents to their limit. This season was not only a learning experience for the program, but it also set the foundation for the future and the future remains bright for Cal State LA. The 2018-19 season was one to forget for the Cal State LA women’s basketball program. 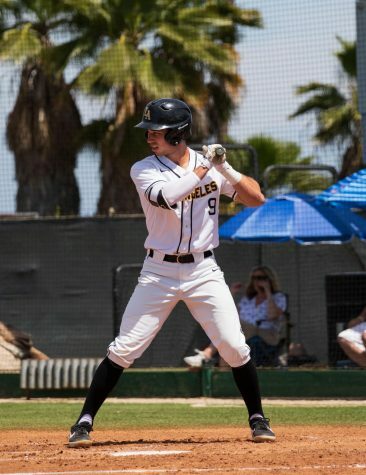 The Golden Eagles were picked to finish in fifth place of the California Collegiate Athletic Association (CCAA) in a preseason poll by the 13 conference coaches after their fifth place finish last season. 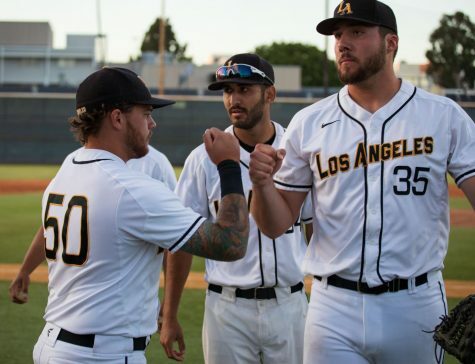 That did not matter however, as Cal State LA finished their season with an overall record of 9-17. They ended up with the second worst record in the conference at 6-16 and missed the playoffs for the first time since their 2014-2015 season. The Golden Eagles were 5-7 at home and had the second-worst road record at 2-10. Cheryl Miller began her third season as the Golden Eagles head coach but had to leave the team due to personal reasons. Torino Johnson, who was the assistant coach at the time, was named as the interim head coach for Cal State LA. The Golden Eagles got off to a strong start, having won six of their first nine games. 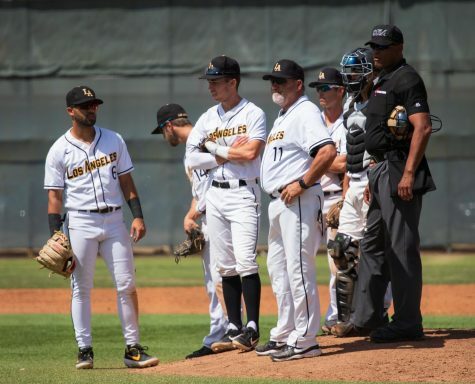 However, everything went downhill for the “Black and Gold”, as they endured a rough stretch midway through the season, as they lost eight straight games. This was their longest losing streak since the 2010-11 season when they lost 10 games in a row. They finally snapped their losing streak against the San Francisco State Gators on Jan. 31, but the struggle continued as they finished the season, 2-7. The women’s basketball team finished 10th in the CCAA in scoring with 1,339 points and averaged the third lowest points per game at 60.9. Despite their losing season, the Golden Eagles still had reason to celebrate as they honored three of the seniors: guards Chiderah Uzowuru, Christine Delapina and Kassie Krueger. Uzowuru was one of the top performers for her team, as she led Cal State LA in scoring with 355 points and averaged the most points per game at 13.7. Uzowuru also led her team in rebounds (193) and steals (50). Christine Delapina had the second-most assists in the CCAA with 110 and finished fifth in minutes played with 738, while Rachael DiRegolo led the CCAA in blocks with 45. Uzowuru was named to the All-CCAA Second Team, while Delapina received honorable mention from the 13 CCAA coaches. 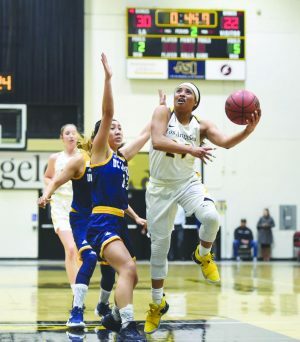 Even though the Golden Eagles’ season did not turn out as expected, the Cal State LA women’s basketball program battled until the very end. 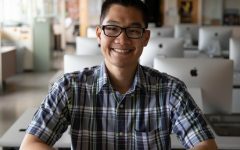 They will look to turn things around next season as they return to action in the fall.